China’s top newspaper has warned the United States that it will pay for selling arms to Taiwan through less cooperation from Beijing, continuing a drumbeat of angry words that appears likely to unsettle, yet not derail, relations with Washington. 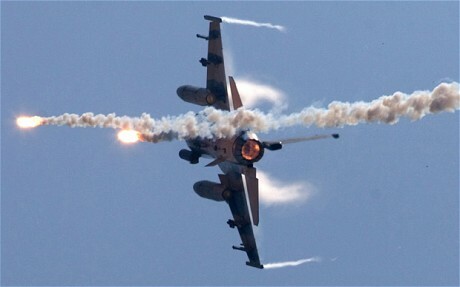 China’s Foreign Ministry has already denounced the Obama administration’s confirmation to the US Congress that it planned a $5.3 billion (Â£3.7bn) upgrade of Taiwan’s F-16 fighter fleet, warning that the move would damage Sino-American military and security links. Beijing also summoned the US ambassador to China, Gary Locke, to a meeting to express its anger over the $5.85 billion deal to upgrade Taiwan’s fleet of F-16 fighter jets, the embassy said. The People’s Daily, the main paper of China’s ruling Communist Party, added to the condemnation and warned the United States it has a big economic stake in ties with China. “Every time the US plans to sell weapons on a large scale to Taiwan, it unavoidably subjects China-US relations to torment and bilateral cooperation is damaged,” said a commentary in the paper. China considers self-governed Taiwan an illegitimate breakaway from mainland rule, and opposes U.S. arms sales to the island on the grounds they sabotage Beijing’s plans for reunification. Washington says it wants Beijing and Taipei to decide their future peacefully, and is obliged by US law to help Taiwan defend itself. Despite Beijing’s ire, the tensions appear unlikely to match last year’s, when Chinese anger over an earlier US arms offer to Taiwan added to several disputes that roiled relations with Washington for many months. In January 2010, China froze military-to-military ties and threatened sanctions against US arms makers after President Barack Obama approved a potential $6.4 billion arms sale to Taiwan left over from the administration of George W. Bush. This year, however, both sides have attempted to keep relations on a steadier path ahead of 2012, when Mr Obama faces re-lection and China’s Communist Party undergoes a leadership handover. The People’s Daily said the Obama administration’s decision would nonetheless carry a price in ties with China. “American politicians are totally mistaken if they believe they can, on the one hand, demand that China behave as a responsible great power and cooperate with the United States on this and that issue, while on the other hand irresponsibly and wantonly damaging China’s core interests,” said the paper. “Have these American politicians considered which weighs more – selling weapons to Taiwan or China-US economic and trade cooperation?” the commentary asked.